Apache is a free and open source web server, it is the most popular web server in the world, and is commonly used in Linux servers. It is developed and maintained by Apache Software Foundation, over half of all servers around the world are running this fast and secure web server. In this tutorial, we will show you how to set up Apache virtual hosts on Ubuntu 16.04, to host as many websites as you want, the limit is your server’s resources like RAM, disk space, etc. The name based virtual host is commonly used to host multiple websites on the same server, whereas in IP based virtual host we can only configure one website on one IP address. In this tutorial, we will show you how to create name based virtual hosts. We will host domainone.com and domaintwo.com on a server, please replace them with your actual domain names. Let’s SSH in to the server and proceed to the next step. We have successfully created an index test page for both domain names. Let’s give permission to user www-data, the default user who runs the apache. We will give you a short explanation about the content of virtual host configuration file. The ServerAdmin sets the contact address that the server includes in any error messages it returns to the client. You can specify your email address here, or even remove the line. This directive is needed, it tells Apache that Apache will process the domain request. Apache will search for virtual host files and process all request if domain/subdomain match with the one configured on ServerName or ServerAlias directive. ErrorLog and CustomLog are the directives to save the log of a domain name hosted on the server. Now, restart apache to activate the new configuration. That is all, we successfully created two Apache virtual hosts for the two domains. You can now open your web browser and navigate to the domain name of the newly created virtual hosts. 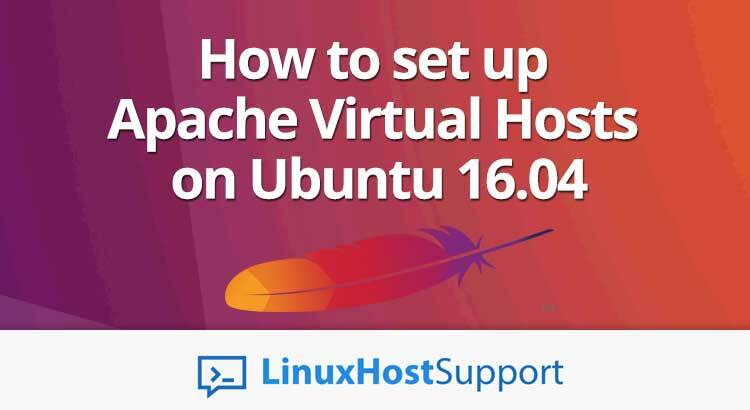 Of course, you don’t need to set up Apache Virtual Hosts on Ubuntu 16.04, if you use one of our Linux Server Management Services – in which case, our technical support team will help you creating the virtual hosts immediately. They are available 24/7, and can cater to any questions or requests. PS. If you liked this post on How to set up Apache Virtual Hosts on Ubuntu 16.04, feel free to share it with your friends by using the social media share shortcuts below, or simply leave a comment. Thanks.